Following is an explanation of how a bronze sculpture is made, from the first model to the final mold to the finished piece. Making the model. First, the artist sculpts a model in a wax-based clay. This "original" of the artist's vision provides the basis for the mold. Unlike a water-based clay sculpture, which can be fired, keptand sold, wax-based clay is good for nothing except sculpting. It has to be trans-ferred into another material tomake it salable. Once the model is finished to the artist's satisfaction, it is taken to a foundry for a mold to be cast. Applying the rubber mold. 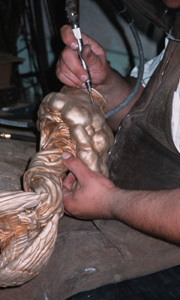 At the foundry, liquid rubber is applied to the surface of the clay model. The rubber is a very heavy product in its liquid state and goes into every hole and crevice of the clay. It is applied a few milimeters at a time. Once applied, it is allowed to set overnight, then another small layer is ap-plied. This goes on until you get the thickness you need, usually 3/16" to 1/4".It usually takes about a week. Once it is dry, you have a flex-ible rubber mold." Applying the "mother" mold. Because the rubber mold is flexible, there needs to be a hard back-ing to keep it in place. Therefore, the moldmakers apply a plaster of Paris (or plastic) mold, called a "mother mold," on top of the rubber. Together, these two molds make up "the master mold." After the plaster has hardened, the master mold is separated along a designated line. (Sometimes moldmakers will place shims or pieces of metal into the clay sculpture before the rubber and plaster molds are applied to make the separation easier.) The model is removed from the mold, and the inside of the mold is scraped clean. 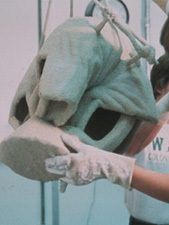 The original clay model is usually completely destroyed in the process. Making a wax replica. 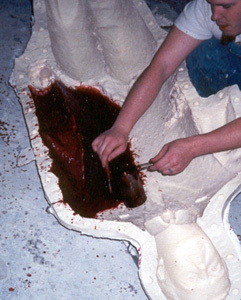 The mother mold is put back together, and liquid wax is poured into it. When the wax hardens, it forms an almost exact duplicate of the origi-nal. However, the wax casting may not retain every tiny detail of the original, requiring additional work by foundry artisans. Chasing the wax. After a wax replica is made, chasers then use special tools on the wax replica to match the detail and texture of the original model. The wax casting has to be completely perfect before it goes to the next stage, because anything in the wax will come out in the bronze. If the sculpture is to be produced in a limited edition, a separate wax model is made for each piece in a limited edition and is "chased" by hand. This process creates a lim-ited edition of multiple originals. Adding gates and sprues. Next, wax tubes called gates and sprues are added to the wax replica. These tubes will eventually form the conduits through which the wax will be "lost," and they will assure that the bronze is evenly dis-tributed throughout the mold. Investing. The wax casting, with the gates and sprues in place, now is dipped into a barrel containing a milky substance called ceramic slurry. After it is evenly coated with slurry, the casting is sprinkled with silica sand. These colloids, or silica, are a kind of glue to hold the shell together. The wax casting is dipped in slurry and sand alternately several times, over two or three days, to create a ceramic mold, or "investment." The invest-ment is allowedto dry for several days. Losing the wax. The ceramic-covered wax casting is put into a burnout oven or kiln for two to three hours at approximately 500 degrees Fahrenheit. The wax melts and pours out of the ceramic gates and sprues-which were formed in the mold around the wax casting-leaving an empty ceramic mold to accept the melted bronze. Sometimes this wax is collected, or reclaimed, to be filtered thoroughly and reused in another casting process. Pouring the bronze. Once the wax has drained completely, tech-nicians wearing heat-resistant suits and gloves remove the ceramicmold from the oven and place it into a trough of sand. The sand is there to support the invested piece,to keep it from tipping over. 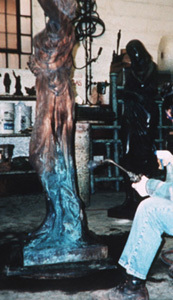 Then bronze, heated to between 2,200 and 2,300 degrees Fahrenheit, is poured into the mold. This is the stage where, if things are going to go awry, they usually do. If there is a crack in one of the ceramic molds, the bronze will run out. Workers are nearby with water pistols to spray a crack if they see one, to stop the crack from forming and salvage the mold. Chasing the bronze. 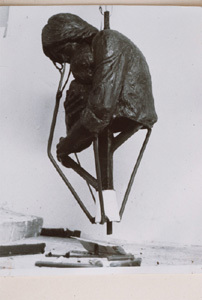 After the bronze cools, the ceramic mold is re-moved from the bronze casting with chisels and hammers. The raw casting still has the gates and sprues-now made of bronze-attached. Bronze chasers remove the gates and sprues, as well as the scars this removal leaves behind. Any bubbles, marks or other imperfections that came through during the casting are also filled in and touched up. After the sculpture is chased, it is sandblasted to remove all particles and residue from the surface so that the patina chemicals will stick. Applying the patina. A patina, a chemical that colors the surface of a bronze sculpture, can be applied to the surface by brushing or spraying it on, or by burying the sculpture in a chemical-soaked textured substance such as sawdust or dirt. There are various kinds of patinas that give you different colors, hues and shades. Patinas can be as various as red, green, white or gold, depending on the chemical used. Common patina chemicals include salts, ammonias, nitrites, even urine (which, early patiners discovered, turns the bronze "the most beautiful emerald green). The patina both adds color and provides a protective layer to the bronze to prevent it from oxidizing. While some artists do the patina themselves, many hire profes-sional patiners, who experiment with a large number of chemicals and mixtures to make various patina "recipes." Adding the final touches. If the sculpture is very large (called monumental or heroic sculpture), or if it is very complex, it usually is cast as separate pieces that can be handled easily. If so, at this point, the pieces will be welded together or taken and assembled at the intended site. The piece is then polished and mounted. Maintenance.Even though bronze sculpture is easy to maintain, it is not maintenance-free. "As long as a sculpture is cleaned and waxed twice a year, it will retain its patina forever, but if a piece is not maintained, especially if it's handled, the patina will begin to rub off and expose the bare bronze. A green oxi-dation will start growing. Some people like that look, but the original patina should be preserved. Many years ago I built a foundry to cast my own sculptures. In order to learn the many techniques of the sculpture and bronze casting process I developed a manual for myself and for my students at workshops. The manual is not for sale in stores, but if you would like a copy, please contact me.